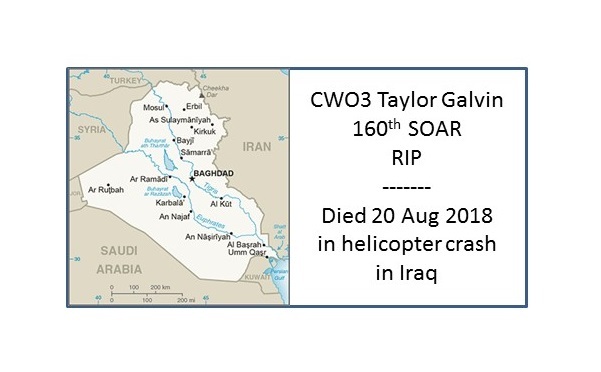 CWO3 Taylor Galvin died on August 20, 2018 as a result of injuries sustained when his helicopter crashed in Iraq. The crash occurred in Sinjar, Ninevah Province. He was assigned to the Delta Company, 1st Battalion, 160th Special Operations Aviation Regiment (SOAR), Fort Campbell, Kentucky. The helicopter crashed late at night while conducting a partnered counterterrorism mission in support of Operation Inherent Resolve. According to CENTCOM the incident was not a result of enemy fire. Three other soldiers received injuries in the crash and were evacuated for further medical treatment. The incident is under investigation. CW3 Galvin was born on December 22, 1983, in Phoenix, Arizona. He entered the U.S. Army as a CH-47 aircraft mechanic in 2003. In 2007, Galvin was accepted to Warrant Officer Candidate School and graduated flight school in 2008 at Fort Rucker, Alabama. 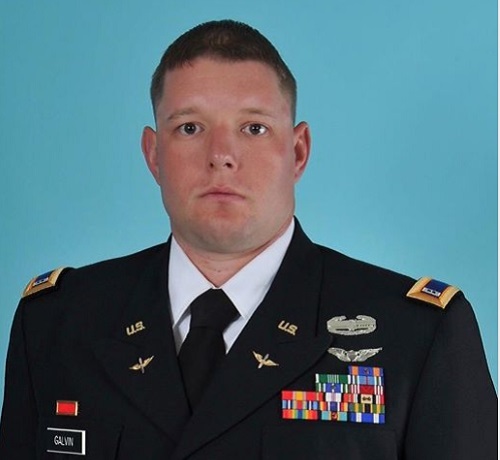 Galvin was assigned to Charlie Company, 2-1 General Support Aviation Battalion, Fort Riley, Kansas, where he served as a UH-60 instructor pilot, deploying twice to Iraq and once to Afghanistan. After a successful assessment in 2015, he was assigned to Delta Company, 1st Battalion, 160th Special Operations Aviation Regiment (Airborne), Fort Campbell, Kentucky, Galvin served as an MH-60M Fully Mission Qualified Pilot. Galvin is a combat veteran with nine deployments, two in support of Iraqi Freedom, three in support of Operation Enduring Freedom, and four in support of Operation Inherent Resolve. His military education includes the Warrant Officer Candidate School; Aviation Warrant Officer Basic Course; Aviation Warrant Officer Advanced Course; the Survival, Evasion, Resistance and Escape Course; UH-60 Aviator Qualification Course; UH-60 Instructors Pilot Course; and the MH-60M Qualification Course. Galvin’s awards and decorations include one Air Medal (C device); Air Medal (3OLC); Army Commendation Medal (2OLC); Joint Service Air Medal (OLC); Army Achievement Medal (2OLC); Meritorious Unit Award; Army Good Conduct Medal (3); National Defense Service Medal (2); Afghanistan Campaign Medal; Iraq Campaign Medal; Global War On Terrorism Expeditionary Medal; Global War On Terrorism Service Medal; NATO Medal; Noncommissioned Officer Professional Development Ribbon; Army Service Ribbon; Overseas Service Ribbon (3); Combat Action Badge and Senior Army Aviator Badge. DoD Identifies Army Casualty, Department of Defense, August 21, 2018. Death of a Coalition Service Member, U.S. Central Command, August 20, 2018.